After discovering new deep sea snails with spiky shells, researchers at the Monterey Bay Aquarium Research Institute named one of them (on the left above) A. Strummeri after Joe Strummer, singer for the Clash. Because they look like punk rockers in the 70s and 80s and they have purple blood and live in such an extreme environment, we decided to name one new species after a punk rock icon. In a recently published paper, five of the new snails were introduced to the world after being collected from their homes in the hydrothermal vents of the Western Pacific and Indian oceans. Trips with remotely operated vehicles and human occupied ones grabbed the snails in trips that spanned fifteen years, 1993-2008. 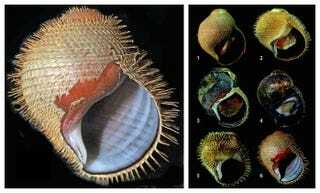 The results of the study were the determination through DNA that, although the snails looked to be the same species to the naked eye, they were in fact six genealogies contained in the previously monolithic genus of Alviniconcha. The paper gives five new names to species of snails, including the drummer tribute.